The era of insta- and micro-blogging has been notable for its proliferation of options—from Twitter to Tumblr to everything in between, there’s no shortage of ways to publish your thoughts online. Posterous stands out in the crowded field because of its simplicity and easy of use. The company’s free Posterous app for Apple’s iOS devices emulates those great qualities. Post Office: The mobile edition of Posterous is a quick and effective publishing tool for getting your thoughts from an iOS device onto the Posterous blogging service. You don’t even have to have a Posterous account to start using the app. Just tap the “post” button, and it creates a Website where you can post content immediately—though if you use this method, you’ll want to register later and properly claim the site. This feature is also a little buggy; after I published a first post using this method, Posterous gave me an error message when I tried to see where exactly it had been published. You’re better off taking the slightly slower method and registering for the Posterous account first. That lets you claim a domain name immediately, and the process can be completed entirely within the app. After that, the Posterous user interface is extremely simple. Users can type out their quick thoughts—though not in landscape mode, a frustration to those of us with clumsy thumbs—or they can upload photos and videos directly from their iPhone. (They can also choose ahead of time to pick default settings for uploading the multimedia in high, medium, or low resolution.) This isn’t really confusing, but even so, the app comes with text and video tutorials to guide the most cautious bloggers. Savvier users can opt to tag and geotag their posts, or they can choose a private setting to keep specific posts limited to viewing by chosen readers. Posterous has some minor shortcomings. The app features an “autopost” mode that lets you direct your entries to other social media sites, including Flickr, Vimeo, and YouTube. But you can’t connect your Posterous account to those sites within the app—you have to leave it and use the browser on your phone (or, more likely, your computer) to make those arrangements. That’s a hassle, and probably an unnecessary one. Plenty of apps on the market are able to integrate with rival social-networking sites. Another nitpick: Posterous encourages users to follow the accounts of other Posterous users by subscribing to their feeds within the Website. The mobile app, however, doesn’t appear to offer any method that a devoted user can track those updates: It’s strictly a publishing tool. 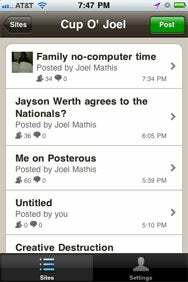 For the most part, however, the mobile edition of Posterous is a quick and effective publishing tool. Text and multimedia uploads took just a second or two when using the app on a phone in Wi-Fi range. Posting got trickier when relying only on AT&T’s 3G network; one post wouldn’t upload at all. There’s far more good than bad here, however. The app’s simple and elegant posting process should make it attractive to any iPhone owner with a Posterous account.